A Hmong family who fled Communist bullets and wild tigers through the jungle of Laos and across the Mekong River to the refugee camp in Thailand. A Sudanese man who was thrown into prison in Ethiopia for helping the Lost Boys and was left gasping for air through a crack under the door. A Mexican woman who taught herself English by looking up the meaning of the profane words that were hurled at her at her first job in a meat packing plant. A Dutch boy, dressed as a cowboy, who put the flag of the Netherlands through the paper shredder and declared, “I am an American.” These are some of the characters brought to life in Vang, a drama about recent immigrant farmers. 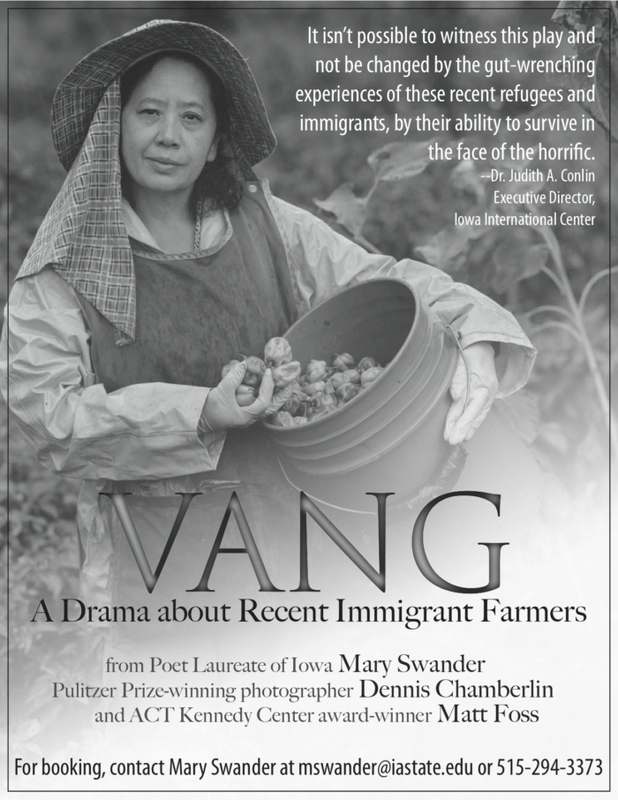 Poet Laureate of Iowa Mary Swander, Pulitzer Prize winning photographer Dennis Chamberlin, and Kennedy Center award-winner Matt Foss collaborated to create a drama called Vang (meaning “garden” or “farm” in Hmong). Swander and Chamberlin documented recent Iowa immigrant farmers. Swander wound their words together to form a verbatim play that captures the immigrants’ journeys to the U.S. Hmong, Mexican, Sudanese, and Dutch immigrants all speak of their struggles, survival skills, and their intense desire to return to the land. Chamberlin took stunning photos of the immigrants in their greenhouses, farms, and dairy barns. Foss added his theatrical brilliance to the production, bringing Vang to life on the stage. And Michael Ching, past executive director of the Memphis opera, composed music to underscore the play’s message. The immigrant farmers in this production came from four continents, speaking over six different languages, with multiple experiences of the world. In their own ways, they adjusted to life in America. Some of these immigrants came to the U.S. as refugees from war-torn parts of the world. Others came fleeing poverty in their homelands. Still others came with money, invited to join agri-business ventures. Many of these immigrants landed in the U.S. and took the only jobs they could find—in meatpacking plants and auto repair shops. But all of these immigrants had grown up on farms and wanted to once again assume the livelihood that they had known in the past, the work that had formed the foundation of their cultural roots. The public often thinks of farmers as white males of European ancestry living in isolated rural areas. And the public often thinks of immigrants as those who have slipped into the United States to take advantage of assistance programs. Vang blows both of those stereotypes and opens discussion about how farming is done in the United States and how immigrants have become part of the larger agricultural picture. The entire play runs an hour and has two actors, male and female, who take on the parts of all 8 immigrants. The play calls for a spare stage with simple movement and props. Dennis Chamberlin’s photos of the immigrants are projected on the walls of the theatre and bring both artistic grace and reality to the performance. With the aid of a grant from the ISU CEAH, Swander, Chamberlin and Foss have been touring the play across the U.S. In addition to a Vang performance, the collaborators are willing to conduct writing, photography, and drama workshops for children and/or adults. Swander, a Distinguished Professor at Iowa State University, teaches creative writing in all genres—poetry, fiction, non-fiction, and drama—to students of all ages. She has years of experience teaching K-12 in the Iowa Arts Council’s Artist-in-the-Schools program. She has taught undergraduate and graduate adult writing workshops at ISU since 1986. The production will need at least a 10×12 space. Technically, we only need a few outlets and the ability to manipulate the lights. The lighting doesn’t have to be fancy—we have worked with large lighting grids and in church basements with just a few wall switches. There are no lighting cues, we just need to be able to adjust lights at a minimum. If you have existing projections and screens, we can usually interface our computer with your equipment, and that is a decision we’d be glad to make with you upon our arrival. We’d like to be able to arrive and set up two hours before the audience begins to arrive. So if the show is at 7:30, we would like to arrive, unload and begin set up at 5:00. That gives us enough time to adapt our performance to your space and then have everything cleaned up and ready to go at curtain time. Photojournalist, and Pulitzer Prize winner, Dennis Chamberlin’s photos have appeared in such prestigious places as The New York Times Magazine, National Geographic, The Economist, and Newsweek. Chamberlin is an associate professor in the Greenlee School of Journalism at Iowa State University. He holds an M.F.A. in photography from Indiana University. He lived much of his adult life in Poland. Matt Foss studied theatre at Roosevelt University in Chicago and in Moscow. He received his Ph.D. from Wayne State University in 2013. Currently, he is an assistant professor at the University of Idaho in Moscow, ID. Mary Swander is the Poet Laureate of the State of Iowa. She has published over thirteen books of poetry and non-fiction, in addition to plays, radio and television scripts and magazine articles. She has appeared in such places as The New York Times Magazine, National Public Radio, The New Yorker, and Poetry Magazine. Swander’s plays Driving the Body Back and Farmscape have toured the U.S. Swander is a Professor of English and Distinguished Professor of Liberal Arts and Sciences at Iowa State University. She holds dual citizenship in the U.S. and Ireland.